Both apples and apple juice may help lower your risk for certain types of cancer, according to a review article published in "Planta Medica" in 2008. Apple juice is also often fortified to provide more than 100 percent of the daily value for vitamin C, although unfortified juice has just 4 percent of the DV. 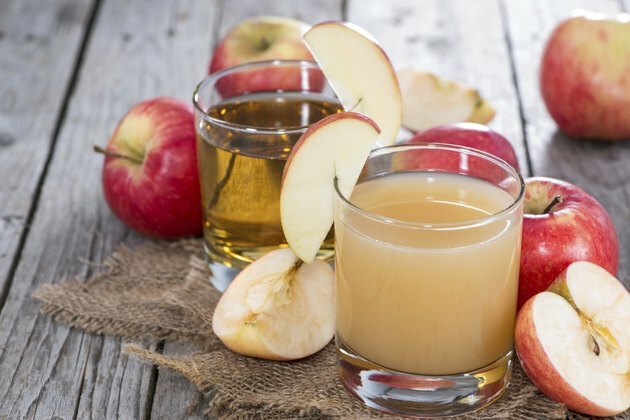 Because of its effect on blood sugar, however, apple juice may not be the best beverage choice for people with diabetes. Maintaining a consistent intake of carbohydrates at each meal can help diabetics manage their blood sugar levels. Diabetics who count carbohydrates often aim to get between 45 and 65 grams of carbohydrates per meal. An 8-ounce glass of bottled apple juice has 28 grams of carbohydrates, comprising a good portion of a meal's carbohydrates. The glycemic index estimates how much of an effect a particular food will have on your blood sugar levels. Foods that have a low glycemic index score of 55 or less aren't likely to cause large spikes in your blood sugar, while those that have a high score of 76 or above often have this effect, according to a "Clinical Diabetes" article published in October 2011. Apple juice has an average GI score of 40, which would put it in the low GI category, making it an OK option for diabetics when drank in moderation. An even better indicator of the potential effect of a food on your blood glucose levels is the glycemic load because it takes into account both the amount of carbohydrates in a typical serving and the food's GI. The glycemic load of apple juice falls into the moderate range at 12. To have a low glycemic load, a food needs to have a score less than 10. This means apple juice is likely to increase your blood sugar levels somewhat when you drink just one serving, but it probably won't cause levels to suddenly spike. Although it isn't necessarily bad for diabetics to have an 8-ounce glass of apple juice occasionally, an apple and a glass of water would be a much healthier alternative. The apple has twice as much fiber as the juice, with 18 percent of the daily value. It also has a lower GI, with a score of 38, and a lower GL, with a score of 6. Unlike fruit juice, which may increase insulin resistance due to its liquid state and high sugar content, apples may have the opposite effect, perhaps because of their higher fiber and phytochemical content, according to the authors of a study published in "Diabetes Care" in 2008. What Does Apple Juice Do for the Body?